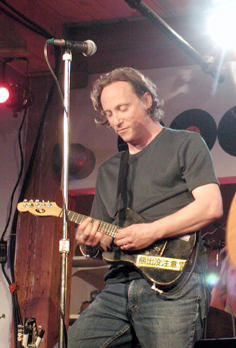 A longtime fixture in the Boston folk scene, Jimmy plays most of the mandolin family instruments, and plays them left-handed. His solo CD, Lost Diamond Angel, features this 5-string electric built by Brad Nickerson. (You can order the CD from CD Freedom.) He has recorded and/or performed with Morphine, Catie Curtis, Brooks Williams, Cheri Knight, the Blood Oranges, and the Beacon Hillbillies. Here's an interview with Jimmy from No Depression.